It took the Suns 50 years to find a great center (sorry Shaq you were past your prime in Phoenix). 50 years after losing out on the No. 1 pick and drafting Kareem Abdul-Jabbar (he was Lew Alcindor at that time), the Suns have found their guy with their first ever No.1 pick in 2018: DeAndre Ayton. Interestingly enough Ayton became the first player in the NBA to have 18 points, 10 rebounds and six assists in his debut since… you guessed it… Kareem Abdul-Jabbar. I had the opportunity to watch Ayton in person in his NBA debut on Wednesday night against his biggest competition for the honor of being the league’s best rookie (sorry Marvin Bagley III) Luka Doncic. Doncic showed flashes of why he may become a very special talent in the league with his next level vision and ability to carve up a defense as a pick-and-roll ball handler as well as getting DeAndre Jordan numerous easy dunks, but he is still a work in progress. Ayton, on the other hand, is ready to be a star from day one. The reason why he is so prepared to be a difference maker from day one is not because of his body carved out of stone or athletic gifts, which he has in abundance, it is his feel for the game and his attitude. The Suns revamped ball movement and player movement from side to side offense under new head coach Igor Kokoskov was run almost exclusively through Ayton from the high post and he has the passing chops, patience, basketball I.Q. and and 17-foot jump shot to exceed in that role. 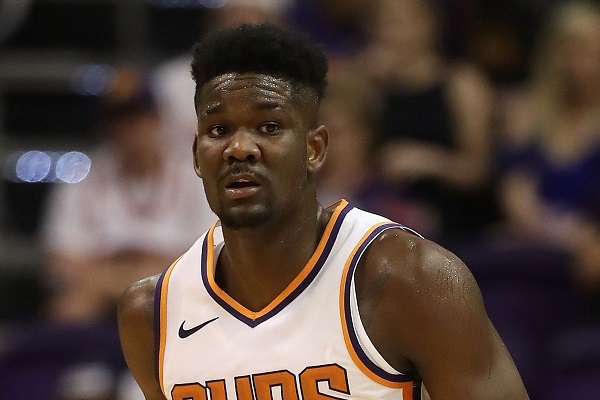 The Suns may surprise a few people this season even in a loaded western conference and DeAndre Ayton will be a major reason why en route to winning NBA Rookie of The Year for 2018-19.